another for land and influence with the Imperial Court. a Minamoto victory and the establishment of the samurai class. Battles followed strictly prescribed rituals. to him the heads of their victims for his inspection and approval. and they would comb and dress the hair very precisely. Their simple, straight appearance suggests that they were made a very long time ago. Of course, on very ancient razors, it is very likely that they didn’t stamp their razors with such a mark, since all razors were made by this steel, just as the ancient Japanese swords also were made of Tamahagane, and didn’t have a “Tamahagane stamp” either. swords and high quality cutlery they used high quality steel and iron. Tamahagane does not necessarily mean it is always excellent quality steel. it does not mean that the product is of excellent quality. that the Japanese usage of “Swedish”, “England”,… steel happened after 1868.
easier to use, more uniform and less variable. maybe decades, by the time it became popular to use foreign steel. entrance only around the end of the 19th century. were most probably made of Tamahagane. round and precious in Japanese, “Hagane” means steel. ⇒ Either way, can we find evidence of how old these Orihi actually are? ⇒ This is a feature which is very rarely seen. on following shown woodblock prints. This razor is very rare, even in Japan, where there are a lot of ancient objects. forging from “Shigeyoshi”, who was an adopted son of “Umetada Myoju”. Barber’s shop, Japan, photographed between 1867 and 1869.
with a Japanese natural waterstone, and even a tomo nagura! Fukuroku is the personification of the southern polar star. Taoist deity from China. Gives wealth, long life and good career. Came in the Edo period instead of Kichijooten (12b) to the seven gods of good fortune. Source: Kiyochika: Artist of Meiji Japan, Henry D. Smith II, Santa Barbara Museum of Art, 1988, p. 60-61. 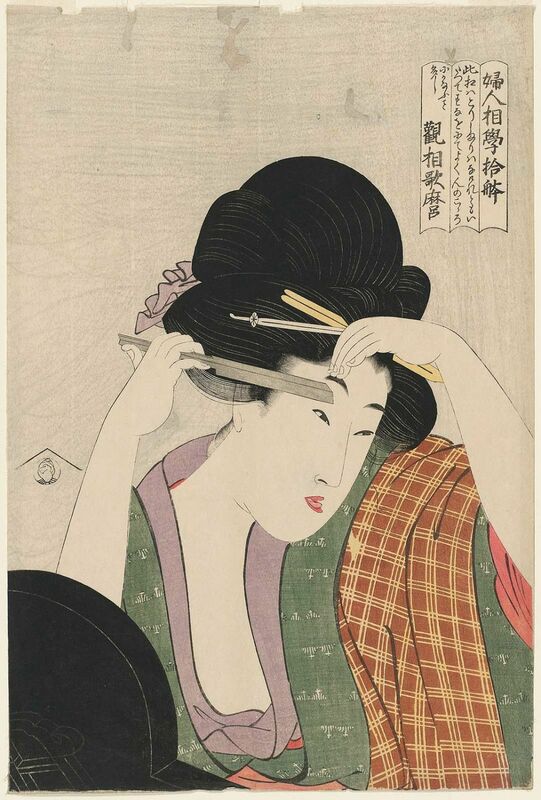 One of twenty-five prints created by Kobayashi Kiyochika (1847-1915), each showing four faces in caricature. The first eight prints were issued in 1882 and published by Hara Taneaki under the series title Thirty-Two Faces, New Edition. The series was so popular that it led to a second series in early 1883 titled One Hundred Faces: Supplement to Thirty-Two Faces (Sanjūni sō tsuika hyakumensō), some of which were published by Hara, the remainder by Morimoto Junzaburo. This entry was posted in 1)Japanese Razors, Orihi type kamisori. Bookmark the permalink. What a great and very detailed article. Will help me to find a good Kamisori. Thank you very much!